C-Line is proud to present a simple biodegradable name badge holder starter kit. The kit includes heavy-duty clear polypropylene holders, hanging cords and 11 x 8 1/2 white micro-perforated insert. The badge features a top loading design for an easy and simple name badge insert. Sealed on all three sides, it provides a premium holder with long lasting life. The archival quality polypropylene material offers an acid-free, permanent storage. It ensures there is no danger to the toners, colors, inks or any other material from lifting off the protector. The Inserts are micro-perforated and can be fully customizable with any inkjet or laser printers. C-Line offers built-in, downloadable stylish templates in Microsoft Word and Corel Word, perfect for a quick project. There is no easier way then with the C-Line name badge holder kit. Welcome to MyBinding Video. 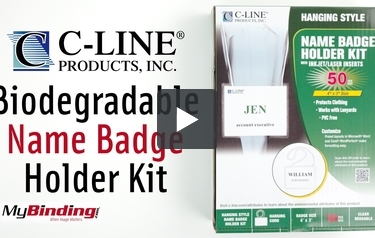 This is the Biodegradable Name Badge Holder Kit from C-Line. Inside this kit are perforated name badge sheets that can be printed with standard word processing software, 50 clear polypropylene holders, and 50 elastic hanging cords. Badges can be printed 6 at a time, then torn apart and loaded into the holders. The hanging cords are very soft and comfortable. The holders won’t stick or absorb ink from badges and can be reused. Each part can be recycled and meets EPA biodegradable standards. For more videos and all your binding needs, visit MyBinding.com.